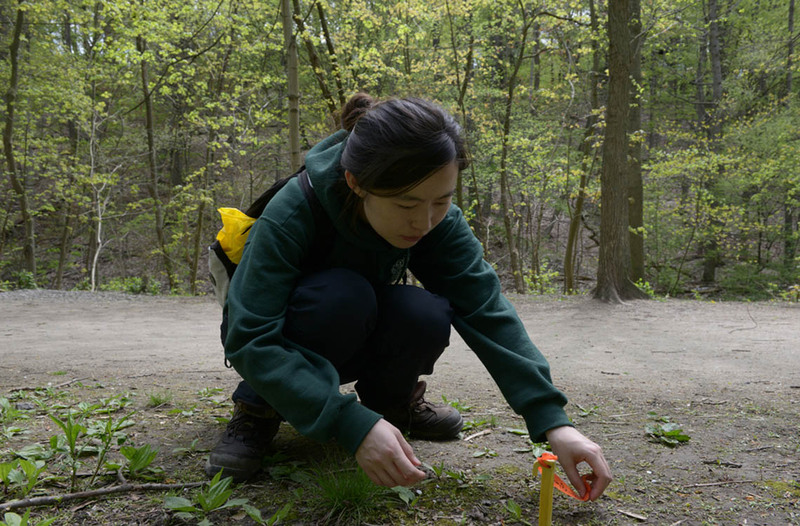 As the city considers a ravine strategy plan, University of Toronto forestry professor Sandy Smith and her students are tracking the ecological changes of a Rosedale ravine – and they're alarmed by what they’re finding so far. Graduate student Anqi Dong says non-native species of trees – including the notorious Norway Maple, a prolific seed producer – have multiplied across Rosedale’s Park Drive Ravine. They have jumped from 10 per cent to 40 per cent of the tree population over the last 40 years, forcing the overall diversity of trees in the ravine into a dramatic decline. Smith, who was part of the City of Toronto’s ravine strategy advisory group last year, and her students are working with community activists and nature enthusiasts to raise funds for further in-depth studies of this area, which abuts Evergreen Brickworks, along with other Toronto ravines. They’re hoping the results of their work will influence the city to prioritize ecological integrity while drafting its revitalization plan for Toronto’s ravines. “If ecology isn’t seen to be the underpinning of the ravines, then those ravines won’t last long in terms of their ability to provide all the goods and services we know these green spaces provide,” Smith said. “One of the issues for ecologists is homogenization. These ecosystems are going to get simpler and simpler, and this means you’ll get fewer tree species, fewer plant species, and fewer animal species. Smith’s students including including Dong, Eric Davies, Alex Stepniak, and Jane Michener have begun working with nature enthusiasts and community groups to raise funds for further research of the ravines. They’ve developed their own website, www.torontoravines.org to raise public awareness. This year they’ve increased the number of plots they’re studying in the ravine to 11, going in with a fine-tooth comb to track both the canopy and the under-story vegetation. They plan to add mammals to the study next year. They’re also appearing at pop-up venues around the city where planners and forestry experts are soliciting public input on the city’s ravine strategy plan to let Toronto residents know about their findings and ongoing research. Amateur naturalists Dale Taylor and Paul Scrivener raised funds back in 1977 for the initial study of the ravine by U of T’s botany department. The two men had both grown up along the Rosedale and Moore Park ravines and wanted to document the biodiversity of the ravine. This time around, they’re working to help raise funds for a comparative study conducted by Smith’s students in the Faculty of Forestry. The City of Toronto says it expects to have the ravine strategy finalized by spring 2017. Matthew Cutler, spokesman for Toronto Parks, Forestry and Recreation, said that while ecological integrity may not appear as such in a draft of the plan released this summer, the strategy calls for developing and implementing management plans for environmentally significant areas and identifying best practices for building projects to ensure natural ecosystems are protected.